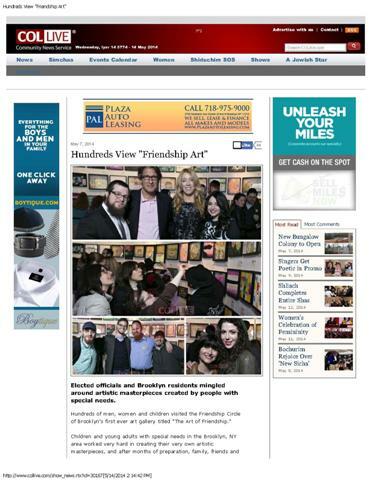 Elected officials and Brooklyn residents mingled around artistic masterpieces created by people with special needs. Hundreds of men, women and children visited the Friendship Circle of Brooklyn's first ever art gallery titled "The Art of Friendship." Beautifully laid out, the gallery took place in the Jewish Children's Museum under the direction of Rabbi Yerachmiel Benjminson who spearheaded the Friendship Circle in Brooklyn nearly 11 years ago. "The space is perfect," said Mr. Joseph Sprung of the Bear Givers foundation, who sponsored the event, adding, "the Museum's amenities are just what's needed to complete the perfect party." Brooklyn's newly elected Borough President, Mr. Eric Adams, who is a long time friend of the special needs community and especially the Friendship Circle, proclaimed the day of the event, May 4, as "The Friendship Circle Day" in Brooklyn, USA.